Join the Young Rail Readers Book Club when we meet every third Wednesday of the month at the Las Cruces Railroad Museum. On March 18th at 3:00 pm we will be discussing The Name of the Book is Secret, by Pseudonymous Bosch. This book chronicles the adventures of two children, Cass and Max-Ernest, as they investigate the mysterious death of local magician, Pietro Bergamo. Throughout the novel the author struggles with keeping a secret, only to give it all away at the end! This book is available at Thomas Branigan Memorial Library. It is also available through interlibrary loan at the Las Cruces Public Schools. An activity relating to the book will be conducted. If you don’t have a chance to finish reading the entire book, an excerpt will be read and discussed. But be warned – we might give away the ending! All students who are reading at 3rd to 5th grade levels are welcome. For more information or for details on book selections, contact Joanne Beer at 575-647-4480 or e-mail jobeer@las-cruces.org. 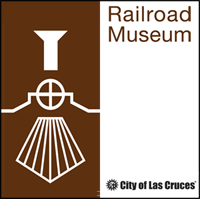 The Las Cruces Railroad Museum is located at 351 N. Mesilla Street at the intersection of Las Cruces Avenue. The exhibits and events are free and open to the public. Museum hours are Thursday through Saturday from 9 am to 4:30 pm. For more information, contact the Museum at 575-647-4480 or visit las-cruces.org/museums.